Forum for Armortek Owners to Meet, chat and share knowledge. You are advised to check 'official advice' before carrying out any modifications. One of my more bizarre 'claims to fame' (and there are a fair few of them ) is that Helen (my ever-supportive wife, who actually bullied me into buying Liesel in the first place) and I bought our house via the 'Escape to the Country' TV show, back in 2009. It seems to be one of their more popular episodes, as we actually bought a house (less than 10% do) - we regularly see it repeated on obscure daytime channels, and still get stopped by people to ask if we're "that couple in the country" in the strangest places (even, once, while on a foreign holiday !). 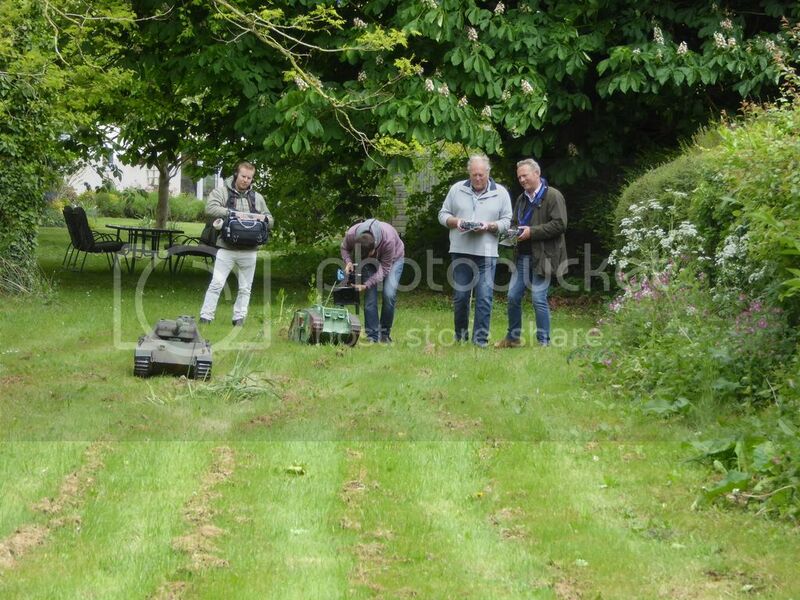 Anyway, yesterday, the film crew came back to do a re-visit, to find out how our lives had changed. A full day's shooting for probably 20 minutes of TV time. 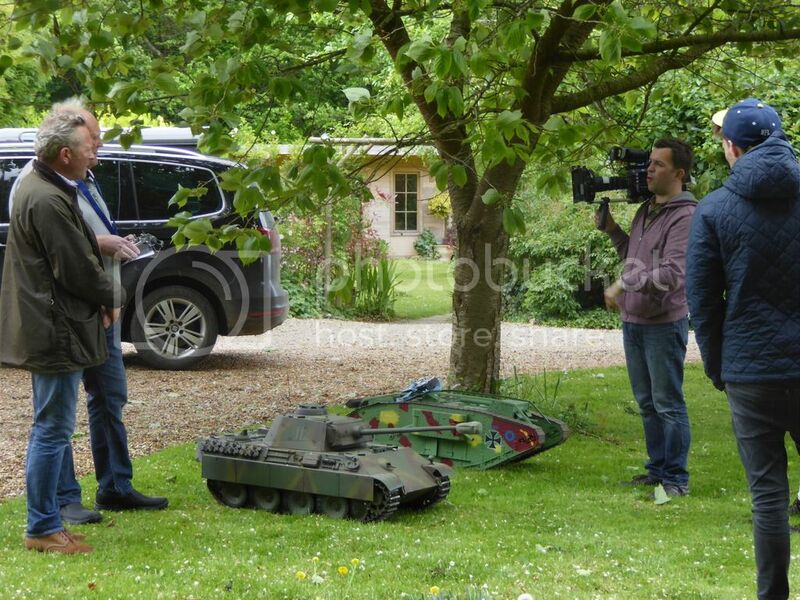 We had to send them loads of pictures and information beforehand and, of course, radio-controlled tanks was something they immediately fastened on to as potentially great TV. 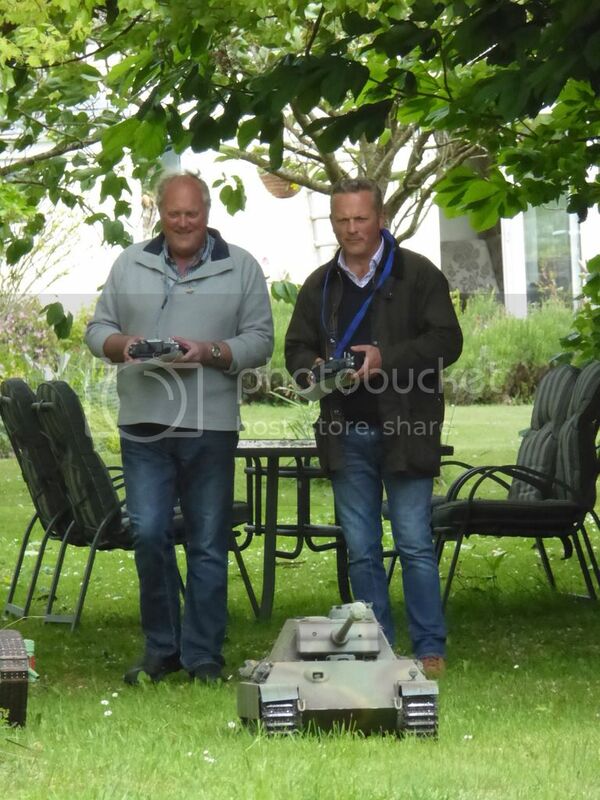 That was helped by the presenter being Jules Hudson (also on 'Countryfile') who's ex-military (indeed, he's just joined the Reserves as a 2nd Lieutenant in the Royal Engineers). So we got the Panther and Liesel out, and ran them around the garden and over the tank course that Helen built for me (the garden being her domain). Jules said that he'd heard of Armortek, and seen the website, but never seen one up close. He winced at the cost (don't we all, at first ? ), but was entranced, and will be coming to Tankfest so he'll catch up with us all there. And, after shooting, all the film crew lined up for a go as well. A great day was had by all. Do let us know if you find out the air date. So you're that elusive and rarely sighted "Escape to the Country" buyer. Knew there had to be one somewhere. Well, it's taken an absolute age (due to BBC presenter issues that I better not go into ), but we've finally been told that our programme will air on BBC 1 at 3.00pm on Friday, 18 January. They goofed a bit and sent us a preview copy, which they're not supposed to do until it's shown. 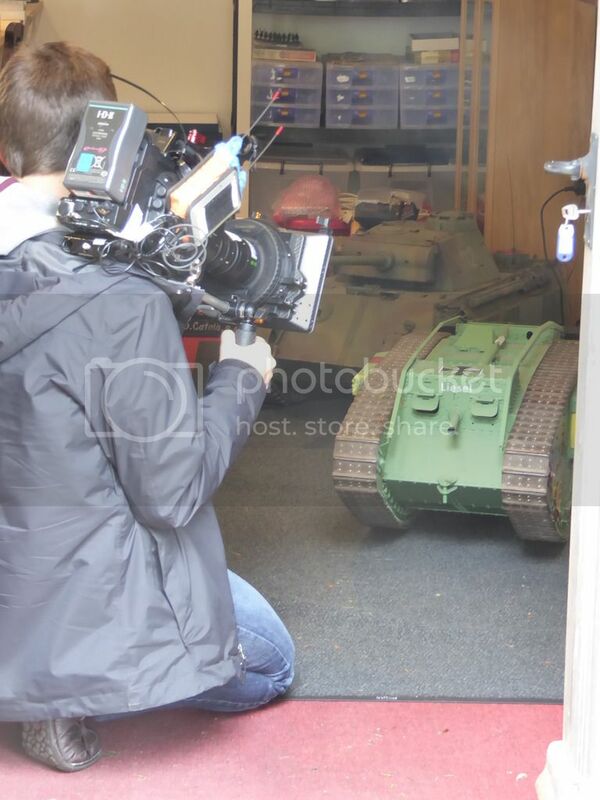 So I can confirm that there's lots of good footage of Liesel (which, despite Jules' comment, is definitely mine) and the Panther G (which we always joked belonged to my wife). It was a long time ago, though - the Panther is now owned by Phil Woollard, and has been exchanged for a Quad, limber and 25-pdr. Flaming Fire II, my second Mark IV, hasn't changed much though . Hope you enjoy it ! It was great fun to film, but embarrassing as all hell to watch - I'm not photogenic enough to be a TV star (for the avoidance of doubt, Helen's the pretty one of the family - even Mia the dog looks better than me on the small screen ). Wish my wife would bully me into buying more Armortek models. Especially ones for "her" to use. LOL. Looks like a fun bit - your moment of fame! 'Konan', my Armortek Tiger 1 Mid! It'll be on BBC iPlayer for a month afterwards. Don't know if that helps. I'm glad they finally came back to see you Chris. Are those your scripts under the transmitters ? (the sheets Adrian refers to are my 'cheat sheets' to remind me which switch does what, and which sound channels make which noises). They didn't use one of my best lines. Jules said "how do we get them out ? Do we carry them ?". I burst out laughing and said "you can try !" and the Producer said "Great ! We'll use that." They never did - it's on a cutting room floor somewhere. Watched the programme, and with such a nice home I’d say you were definitely one of their success stories. More importantly though, given the obvious delight and boyish grin on Jules’ face can we assume he’s now a signed up Armortek customer?? More importantly though, given the obvious delight and boyish grin on Jules’ face can we assume he’s now a signed up Armortek customer?? My God that is gorgeous country! Sweet video. Now we know where to have the Club BBQ Chris.